This article is a review of GUNS & TALK. As part of this year’s mini-retrospective a selection of the films of director Jang Jin were shown. I caught GUNS & TALK (2001). It is meant to be a hitman comedy, except it isn’t very funny; or perhaps the jokes are lost in translation? It follows a quartet of hitmen (two of whom are brothers, and all are friends) who carry out various jobs. There seems to be no introspection on their part, apparently indifferent to killing women and maiming people. I don’t have a problem with an amoral film but it just seemed weird that there was no self-analysis among the characters, while everyone in GUNS & TALK seemed self-consciously “quirky” – which made them grate. I didn’t care about them or their predicaments. The film just felt very silly and boring. It says nothing of interest, nor was it engaging. Added to this is the tortuous twee music that accompanies proceedings. The closest analogy to GUNS & TALK is probably Mark Wahlberg’s clunky THE BIG HIT. The director said as an intro that he didn’t want his film to be tacky 10 years on. Was he being serious? How was this not tacky on its original release? This is like a crummy hitman sitcom. 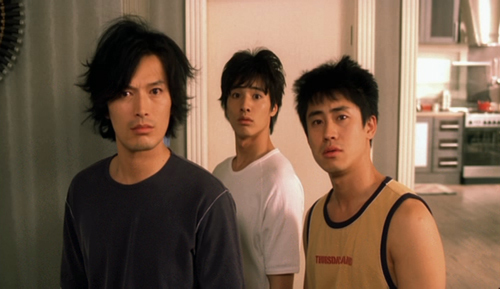 Compare this to a lovely and fun crime caper called AU REVOIR TAIPAI. The only saving grace for GUNS & TALK is that appears to strive for novelty, which should be applauded, and it is different. It also seems to have been influenced by Tarantino’s self-reflexive oeuvre, but with little of his success unfortunately.